Real World Railway Conductor. But here I'm just a noob scenario creator finding my way, and hopefully coming up with stuff that's half decent. Not played the scenario yet but looking at the screen shot, is the 67 pulling? If so, the 67 pulls up from Cardiff but then propels from Chester to Holyhead. If this is what you have in place ignore these whitterings. The 67 is indeed pulling – however with the Premier set it’s not set in stone which way around it goes – it tends to swap around every so often. The 2nd set that sticks to the North Wales Coast and stables in Crewe every night does keep to the same formation, and if it ever finds itself the wrong way around it is turned on a triangle at the first opportunity. The Premier set however tends to stay the same way around for weeks on end. I live on the line and I must have missed the occasions when the 67 pulls. 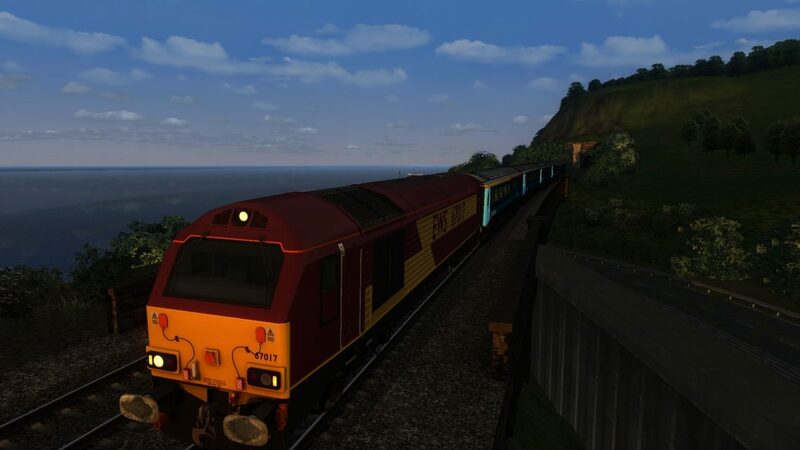 I’m a guard who works the other end of that services route, and used to sign loco hauled stock (not currently competent though). Trust me, it frequently runs both ways around – I’ve even worked it as such! That said, the main reason I have the 67 leading is that as far as I can tell, only the HUD DVT has been modded to work with the 67 and not the ADV one, and I find the HUD DVT too basic for my tastes. I wasn’t disbelieving. I’d like to catch it that way for photography reasons.